Median household income is an economic indicator commonly used as a proxy for quality of life. This metric is also often used to determine if residents in a given location are able to afford the cost of living of residing in that area. In conjunction with per capita income, median household income is used to determine the wealth of a given region. Louisville currently ranks 9th among its peer cities in median household income with a median income of $48,264. 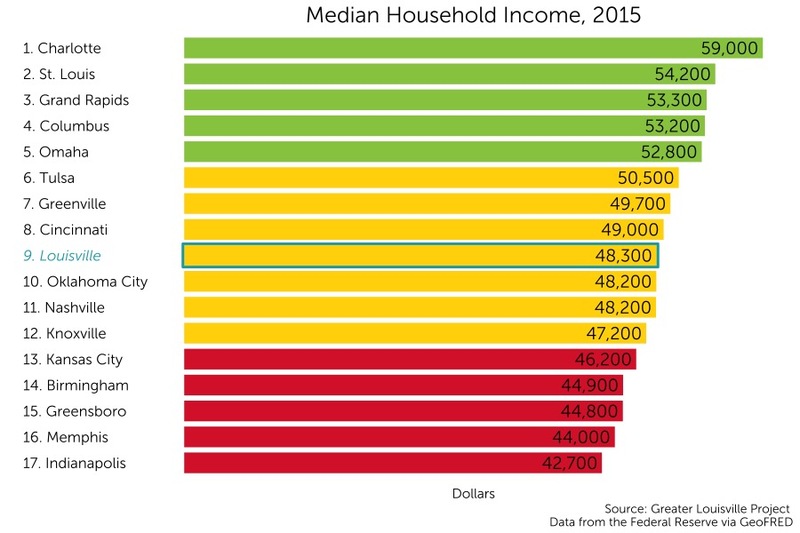 How does the median household income vary across Louisville? Although Louisville ranks 9th out of 17 cities in median household income, there is tremendous variation across the city. In the map to the left, areas with higher median household income are displayed in green, and areas with lower median household income are displayed in red. Households have higher earnings in eastern Louisville in communities such as Northeast Jefferson, where the highest median household income reaches $87,300 in some areas. The median wage is lower in western and southern Louisville, where areas of Russell and California have median household incomes as low as $17,200 per year. After a period of steep decline from 2007 to 2009, Louisville’s median household income began to rise. Since 2010, median household income in Louisville has seen a steady rate of improvement relative to its peers. 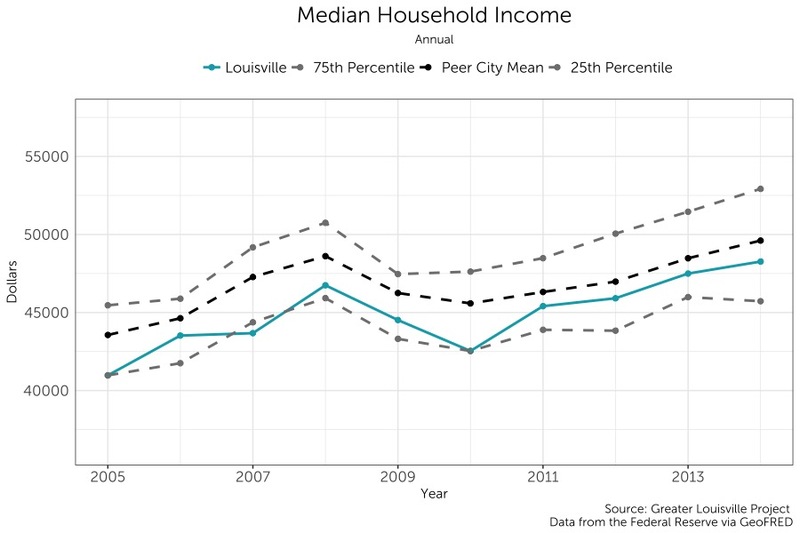 However, despite this improvement, Louisville’s median household income still remains below its peer city average.